Sikkim, the 22nd state of the Indian union, is a small mountain state in eastern Himalayas. The kingdom of Sikkim is located between 28o 07' 48" and 27o 04'46" north latitudes, and 88o 00 58" and 88o 55'25" east longitudes. It is bounded by Tibet on the north, Nepal on the west, Bhutan on the east and West Bengal lies to its south. It is the least populous state in the union. Sikkim is strategically important for India. It lies astride the shortest route from India to Tibet. The capital Gangtok, which is situated in the east district, is the principle urban centre; in this district more than one third of population resides now. The capital of the state can be said to constitute the focal point of all socio-political and cultural activities. It is connected by well-developed road links with all four districts. Gangtok, is the principal commercial centre of the state. Being the seat of the government, it has become the most important centre of administrative and political activities. The population of Gangtok is composed of all ethnic groups -the Bhutia-Lepcha, the Nepali and the plainsmen. Sikkim is a land of rich and varied scenic beauty, magnificent mountains, eternal snows, dark forests, green fertile valleys, raging torrents and calm, placid lakes. Her magnificent variety of flora and fauna are the naturalist's dream; the steep variations in elevation and rainfall give rise to a glorious multitude of species within a comparatively limited area. The scenic grandeur of mighty snow-capped peaks, the highest of which is the 28,162 feet Kanchanjunga on the Nepal-Sikkim border, has been a symbol of romantic awe and wonder for the people. It is the world's third highest peak. 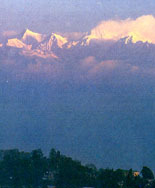 Kanchanjunga has five satellite peaks: Jano, Kabru, Pandim, Narsim, Simiolchu. Two principle mountain ranges are the Singilela and Chola which start in the north and continue, following a more or less southerly direction. Between these ranges are the principle rivers, the Rangit and the Teesta, forming the main channels of drainage. These rivers are fed by the monsoon rains as well as by melting glaciers.